Arginine vasopressin (AVP), which induces vasoconstriction and conserves solute–free water when released during high plasma osmolality, is secreted through 2 mechanisms: osmoregulation and baroregulation. 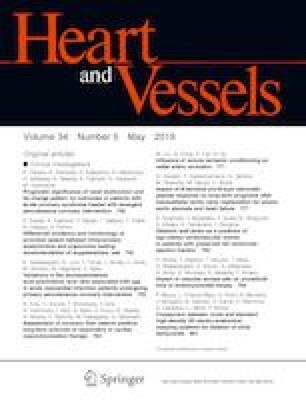 This study aims to clarify the mechanisms and influencing factors for non-osmotic AVP secretion in adult patients with congenital heart disease (CHD). AVP levels were measured in 74 adults with CHD. Non-osmotic AVP secretion was defined as excessive AVP secretion relative to the AVP level inferred from plasma osmolality. Accordingly, 10 patients (13.5%) demonstrated non-osmotic AVP secretion, with AVP levels higher than those in patients without non-osmotic AVP secretion (6.4 ± 3.1 vs. 1.6 ± 0.9 pg/ml; p < 0.0001). Non-osmotic AVP secretion was significantly correlated with diuretic use [odds ratio (OR) 7.227; confidence interval (CI) 1.743–29.962; p = 0.0006], HbA1c level (OR 11.812; CI 1.732–80.548; p = 0.012), and B-type natriuretic peptide (BNP) level (OR 1.007; CI 1.001–1.012; p = 0.022). Multiple logistic regression analysis revealed that there was a significant association between non-osmotic AVP secretion and HbA1c level (OR 9.958; 1.127–87.979; p = 0.0039), and a nearly significant relationship between non-osmotic AVP secretion and BNP (OR 1.006; CI 1.000–1.012; p = 0.056). In conclusion, this study showed that 13.5% of adult patients with CHD demonstrated non-osmotic AVP secretion, which could be correlated with heart failure and insulin resistance. The AVP system might be one of the mechanisms linking heart failure and the onset of type 2 diabetes mellitus in adults with CHD.